Have you wondered for years what sort of skin you really have? Or what the real age of your face is? Or how you will look in 5 years time? For a really in-depth assessment of your current skin condition we use the state-of-the-art Visia Complexion Analysis. This is the latest technology from the US which allows us to scan and map exactly what’s happening above and below your skin’s surface. Using this information and the series of photographic scans which the consultation produces, you will be able to make informed decisions about the right skin care regime for your skin and we can advise you on the most effective treatments and programmes to achieve the results you want. Available at our Teviot Place and Hanover Street salons. 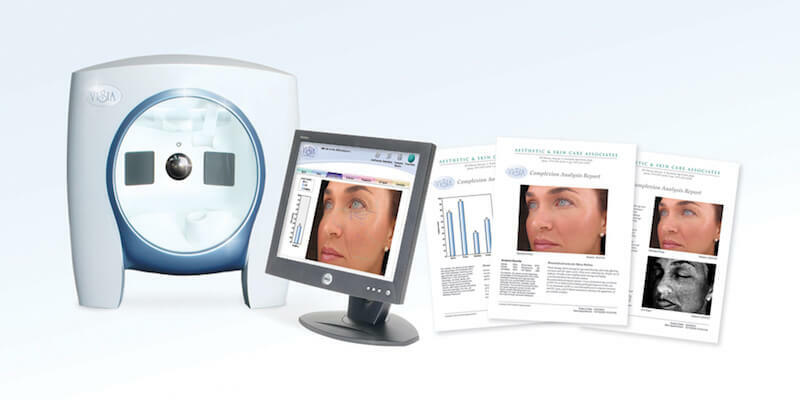 Used around the world by cosmetic surgeons, dermatologists, and other medical and skin care professionals, the Visia Complexion Analysis System captures multi-spectral photos of the face, examining the complexion for wrinkles, spots, pores, texture, bacteria, sun damage, pigmented spots and acne. Each of these 8 criteria are mapped individually and compared to others of the same age and skin type. You will receive a personalised skin report with your 8 separate photographic scans to take home. A Visia Skin Analysis takes about 20-30 minutes and costs £35, although this is fully redeemable against any purchases of skin care products on the same day (Minimum purchase value £70). We also offer this treatment complementary if you are booking a facial.